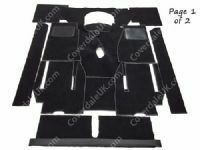 Our Austin Healey carpet sets include all pieces needed to re-carpet the interior. Choose from our wide variety of colours in our three ranges - Blenheim polypropylene, Wessex wool or Kensington wool for the ultimate in luxury. The edges are expertly handbound in leathercloth and a driver's heelmat is attached. We have a huge library of patterns from Austin to Wolseley. If you do not see your vehicle we may still be able to make it - please contact us. Please note that due to high demand for our carpet sets there is usually a 2-3 week waiting list.